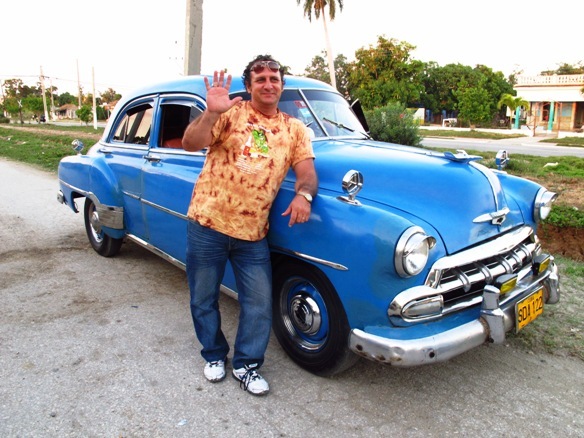 GOING ON ADVENTURES: What is life like for regualr Cubans? 1950s vintage cars are still a big attraction for tourists to Cuba. We rode to dinner at a paladar in this blue Ford. More people are clamoring to visit Cuba since certain regulations have been lifted regarding travel from the U.S. However, most tourist and trade regulations are still in place, so I think little has changed for the average Cuban citizen since my visit there in March 2013. 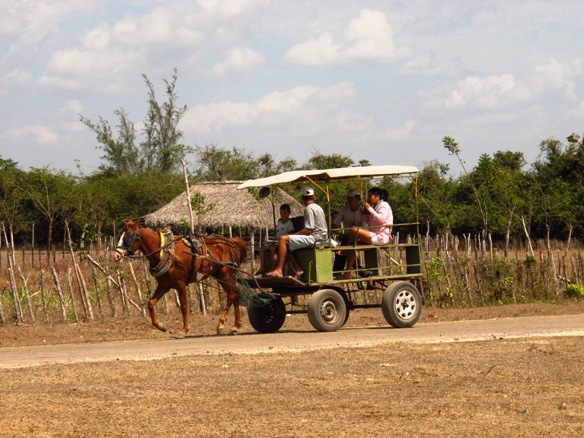 Horseback or horse-drawn cart are primary means of travel in rural areas. The idea of going to Cuba “before it changes” is understandable, but it will likely be many years before big box stores and chain hotels line the streets. 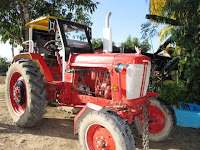 Cuba is still a poor country, and the government is very much in charge, limiting economic growth of the people who live there. 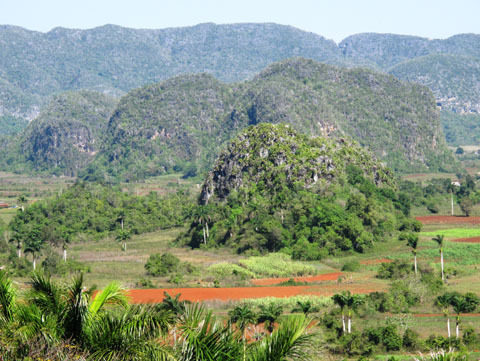 Our travels covered more than 1100 miles during which we realized that Cuba is a country with contrasting landscapes: rugged mountains, lovely beaches, and green valleys in addition to bustling cities and remote rural areas where not much has changed since the 1950s. Keep in mind, however, that if you visit by cruise ship, you'll get a very limited view of Cuba. 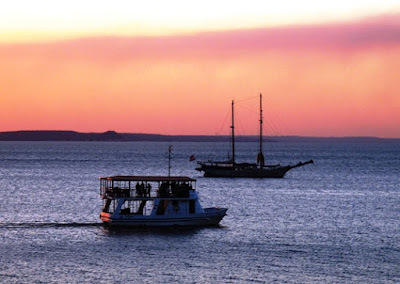 As for other cruise ports, one or two days in Havana will hopefully whet your appetite to return and see more of this distinctive island country. of culture and history in Cuba. I’m glad we went and met people from all walks of life—artists, farmers, scientists, school children, and ordinary folks. I plan to write a series of articles based on my experiences—the good, not so good, and surprising-- so please check in frequently. children indicates their grade level. Education is provided for 12 years through secondary school where test scores and grades determine what you can study at university or trade schools. That’s also determined by the province where you live and its needs. There’s no charge for college if your scores are high enough, but you pay for career education with social service—working for three years wherever the government dictates. People in public service careers like teachers, doctors, or engineers don’t get paid much. “One of worst things in Cuba is salary—what you need to live on versus what you earn is not balanced,” Jessie said. 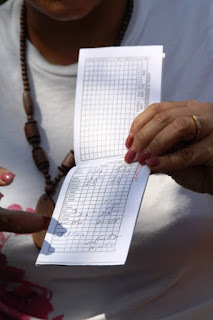 A doctor earns 25 CUC a month—roughly equivalent to 25 dollars (Jessie’s husband is a doctor). A carpenter or mechanic earns much more. Jessie estimated Cubans need about 300 CUC a month for living at a standard much lower than is typical in the U.S.
Cubans who work in tourism, as she does, work for the State but depend on tips for a living. For multi-lingual guides like Jessie, increased tourism means more American dollars (We tip well). Tips also support waitresses and bathroom attendants (keep those coins handy), who must have a license to do their jobs. “You have to have a license for everything,” Jessie told us. The Vinales Valley is green, agricultural, and scenic. Hotels and restaurants are run by the government, which owns at least 51 percent of foreign properties (U.S. owned companies, for example). While private business is allowed in some cases, the State limits potential growth. “The State can close (take away a license) if it thinks a private business is getting too big. It may claim a lack of quality, even though private is usually better,” Jessie said. 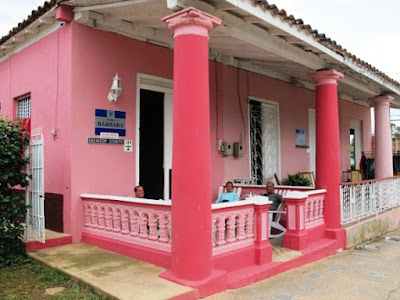 Cubans can rent one or two rooms of the house where they live (If you want to stay in a home, know that quality varies considerably and furnishings are sparse). Or they can start a restaurant at their residence within limits (These family-run paladars are very popular with tourists). Private businesses pay taxes, but there are no taxes on homes or property. Credit is not common, so if you want to buy a house (hard to come by), you pay directly to the seller, who pays a hefty tax to the bank. Internet and cell phone service are sketchy or non-existent (Cuba is working to improve this). Cubans are issued ration notebooks at birth that stipulate the amount of staple food products they are allowed from the government each month. Per person examples: five pounds of rice, five pounds of brown sugar, three pounds of white sugar, half pound black beans, 10 eggs, one pound ground beef, and half a chicken. Most people shop at the first of the month because stores often run out. Because items like matches, soap, shampoo, and toothpaste were removed from ration books a few years ago, they are very expensive. You'll see people on the streets hoping for a hand-out of such items. We brought personal care items to donate, along with school supplies, that were given to our guide to distribute where needed. As you can see, normal Cuban life is very different from that in the U.S., despite the fact it's barely 90 miles from the Florida coast. Changes at that level will come slowly. The government is still a Communist dictatorship, a fact worth remembering.